This luxurious residence is equipped with all comfort with pool and Spa facilities. The price we ask is all-in only 10€ per stay per person for bed, bath and kitchen towels, wenn you leave you will not be faced with annoying payments. The swimming pool is heated from March 31st. till October 31.This ensures that you can still swim with rain or bad weather. The house contains a cozy living and dining room with a designer fireplace and underfloor heating. The villa has Wifi and ProxmusTV + video and numerous videos including kindervideo's, the TV is a 50. From the living room and the kitchen you come out onto a large terrace facing south. The modern kitchen has a large storage shelf dishwasher, oven, microwave, refrigerator, Senseo + coffee maker, kettle, lemon squeezer toaster and suchlike, everything to meet your needs. From the kitchen you enter the wellness area, which contains an infrared sauna for 2 persons (with built-in CD player). and solarium with face tanner (mark collasun). Also on the ground floor is a small utility room with washer, dryer and freezer 60 liter. From the Wellness area you arrive in a large garage where is a football and ice hockey game also place for one car, bike and suchlike, the garage door is electrical. Furthermore there are three bedrooms upstairs, all with double beds and large modern sliding door wardrobes. Two bedrooms have a mezzanine. There is a large bathroom with shower, double sink, bath and toilet, and a second small bathroom with sink, shower and toilet. The two bathrooms are opposite the bedrooms and these bathrooms have enough towels. The staircase is secured with a security-gate for the little ones. The house has three toilets and three showers. The heated pool you can reach via the spa. 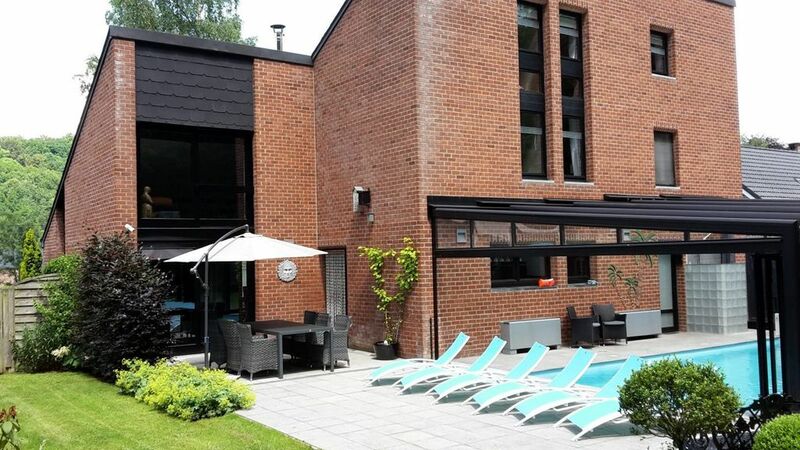 It's indoor swimming pool and provides the opportunity to push open the doors with nice weather so the pool house to one side is completely open. The pool has a size of 8 x 4 meters, equipped with underwater spotlights this gives romantic colors so swimming in the dark is fun, and you feel like in the tropics, also is in the pool house a shower. We draw your attention again to the fact that the pool is heated only from April 1. till October 31st. The house is surrounded by a large landscaped garden. The rear garden is fully enclosed with fencing. Littlel children and / or dogs are perfectly safe there. so that litlle children-or dogs are safely in the backyard. Placing from the gate is included in the price. The large terrace is equipped with 6 chairs and a large modern dining area for 6 persons, with luxury parasol. A folder is available with route description how to find the main shops, as well as hiking trails and useful tips. Bomal is a very nice castle village, between the Ourthe and the Aisne. In the village itself is a big Spar and it has even a small post office , a cozy circular plaza where you can sip a drink and small bite to eat. There are a few restaurants, two bakeries a pharmacy, doctor, dentist, hairdresser, bank, newsagent, indoor tennis court, playground and opportunity to rent canoes. At a short distance you will find fun activities for everyone. € 7.50 to rent a tennis court. Barvaux is verry known for its maze (the largest of Europe) and this is 3 km away from Bomal there you can spend an entire afternoon without difficulty in Barvaux are also miscellaneous restaurants and shops like Aldi, Spar, Delhaize, which are also open on Sundays. 10 km away there is the Aventures park with mountain climbing, abseiling, karting, canoeing, fishing etc. The village Logne 3 km away 2x daily gives a great bird show with falcons among others, here's from the villa a very nice and beautiful walk. This goes along the Ourthe, you also pass the rock (see photo). In front of this rock Ourthe is very deep and there is also a lot of swimming and diving off the cliff. Every Sunday morning there is a large market in Bomal, it is in the whole region known and visited. From the villa you can make several mountain walks. The house is situated in the same street as the castle and you can also make a nice walk in the park and then walk back along the river Aisne. Durbuy is the smallest town in the world and is at a distance of 15 km. There are lots of great restaurants and mini golf. There is also a boxwood park, highly recommended! Furthermore, there is at a distance of 15 km a known golf course. You can then visit the caves in Hotton and Remourchamp 20 km away. Remouchamp is a real winner with the longest underground boat trip in the world! Look on the Internet ,,grotten van Remourchamps,,. After a hectic life and have lived in a noisy environment, we have chosen to live in the Ardennes. We are settled here and enjoy every day of the beautiful surroundings. That is why we are totally behind to rent our villa to other people to give it the same. We lived first near Amsterdam at that time we had a holiday house in the Ardennes and wen we stopped with working to go live forever in the Ardennes. We have chosen a village that is not too big but yet all facilities owned. That's why we chose Bomal it's a romantic castle village and offers everything you need. There is a large Spar,, a pharmacy, doctor, dentist, hairdresser, bank, bookstore, bakery, indoor tennis court, playground and an opportunity to rent canoes and cozy round square where you can have a drink. Bomal is not only known for its beautiful scenery and hiking opportunities there's also Sunday market is well known. In the pool house is an extra shower. A beatiful villa, well appointed, comfy and cosy. With a warm welcome too. Thoughly enjoyed our stay and would go back again. Definately recommend this villa to stay in. Thank you very much. Very clean and comfortable, with everything needed. The house is very well appointed, has everything you need provided. Beautiful pool that we used at least once every day with the extra warm weather that we had. It is a lovely peaceful location on the outskirts of the village, which has a bakers, great butchers, supermarket, chemists and few restaurants/bars all within easy walking distance. It was a great house to spend some valuable time with the kids, playing in the pool together and just hanging out. There are also plenty of places within easy driving distance to discover - some lovely quaint towns, European space centre, Bastogne war museum were all good for the kids. The Sunday market in Bomal is really good, plenty of food choices with lots of stalls selling all sorts of things. And plenty of drink choices if you want to make a day of it and don’t have to drive anywhere! Johanna was a great host and very helpful both before and during our stay, answering any queries we had. We will be back soon! Beautiful home, in beautiful setttings . We were excited to go to Bomal after the reviews we had read and emails we had shared with Johanna, who had been so helpful. We arrived to be met by Johanna and her husband Jean who showed us around this beautiful house. It was fully equipped and spotlessly clean. The garden is stunning and houses the pool which my children adored. Inside the decoration was fabulous but homely. Johanna's art work is brilliant! We ventured to Luxembourg , Germany, and Holland. But a short distance away you have the Labrinth, Durbuy with the topiary park and golf and the caves. Also lazy days enjoying this house are a must. We celebrated our tenth wedding anniversary whilst there and we were greeted with a beautiful door decoration, hearts and a photo. Quite simply this is the best holiday accommodation we have ever stayed at and we would love to return in the future. I want to start off by saying that Johanna and Jean were amazing! They met us when we arrived and showed us around the place, explained how to work things that we were unfamiliar with, and made us feel at home. This is so important when the appliances have unfamiliar words and symbols on them. The kitchen was well stocked with dishes, pans, utensils, spices and coffee. The picture that they made of us was a nice touch and the complimentary bottle of wine and beer samples were appreciated. My wife was an art teacher so she appreciated what Johanna had done with design inside and outside. This was the nicest home that we have rented in five years. Everything needed for a great stay was available. The house was very clean and everything worked to perfection. I am a compulsive fixer, so in that regard I was stymied. We tried to leave the house as good as we found it, but that was a pretty high standard to achieve. We loved the heated and enclosed pool. It was very welcome after a day of sightseeing. Bomal sur Ourthe is a nice quiet town from which to explore. The center of town is within walking distance. It also has a very large and fun outdoor market on Sundays. As an American, the trip to the Ardennes American Cemetery and Memorial near Liege was very moving. There were so many things to see within a two hour drive that we wished we had more than two weeks there. We are all Andre Rieu fans, so a trip to Maastricht was mandatory to see the square where he gives his hometown concerts. The shopping there was also great. We did not find anything but good restaurants when we ate out, so Hooray for Belgium and its very friendly people. We appreciate you. From the house one can withdraw wandering the woods. One can also take the bike path along the Ourthe to Durbuy. Bomal is an ideal place for mountain bikers and climbers.